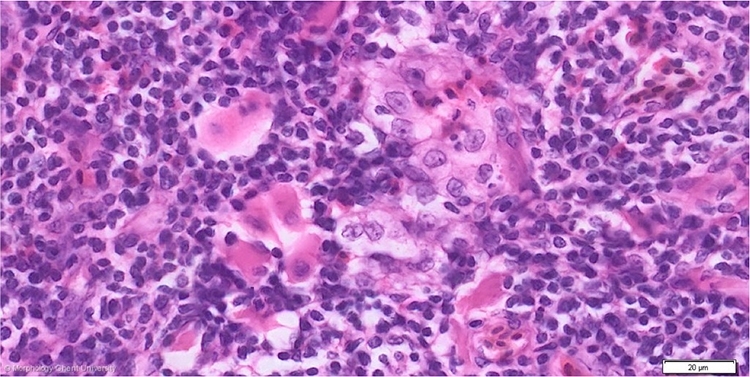 Myoid cells are large, syncytial, eosinophilic staining cells that occur in the thymus of birds and reptiles. They are mostly situated in the medulla or at the corticomedullar junction. They contain two or more centrally lying nuclei that are surrounded by irregular myofilaments. Sometimes, cross-banding is visible on longitudinal section. The origin and function of myoid cells is still uncertain.